Everyone has dream to purchase own house, where one can live with peace and happiness. Many people can’t afford to purchase it due to hefty price or may end up purchasing it by taking Home loan. Once you take home loan property is actually yours but you have home loan as big financial obligation. Every month you have to pay considerable amount of money as EMI (Equated monthly installment). E.g If you take Home loan of Rs. 10 lakh for 20 years at interest of 11%, you have to pay nearly Rs.10, 500 per month. If you make calculation you will end up spending hefty amount of more than Rs.25 lakh this is due to payment interest on principal. At any point of time do you feel uncomfortable that you need to wait for number of years to free your home from loan? Think of closing your home loan before it becomes lifetime burden. One good way to close your home loan earlier is “prepayment”. (1) When you can start prepayment of your loan? (2) Whether you can make part-prepayment or not? (3) Any penalty is applicable on prepayment or not? Once you have above information you need to calculate outstanding loan amount and how much repayment is possible by you. Most of banks do not impose any penalty but, if your bank has limit of partly repayment you need to ensure that part-prepayments do not exceed this limit to avoid a prepayment penalty. If by any chance you need to pay penalty charge keep in mind that this penalty should be much lesser than interest value saved. You can plan to make prepayment every quarter or half yearly based on your convenience. Every month start preserving some money for this. If possible follow discipline and make SPP – Systematic prepayment plan. This prepayment will bring down your outstanding loan and lead to saving on overall loan payment. By prepayment like this you can not only save on net interest but you will get ownership of your home earlier than planned. Longer the tenure more you will pay, hence it is good decision to make multiple part- repayment of home loan to shorten the tenure and to reduce interest burden. Provided you can manage outflow of this prepayment comfortably from your current income. Another way to reduce home loan burden is to increase EMI. Bank usually cap certain maximum limit on EMI based on your monthly income. So, way out is to make part-prepayment. Let’s take small example how much interest you can actually save when you prepay your home loan. Mr.X has taken home loan of Rs15 lakh for loan tenure of 20 years @ 11 % interest rate. EMI of this loan comes out to be Rs.15,696. If Mr.X does not opt for any prepayment he will end up paying Rs 15 lakh principal and net interest of Rs.22.67 lakh. If Mr.X is wise person like you and opts to pay 50,000 Rs/- every year towards repayment (total repayment 5.5 lakh), tenure of this loan will be reduced to 11 year and net interest paid will be Rs 11.94 lakh. So actually Mr. X can save hefty Rs 10.73 lakh which can help him for building good retirement corpus or may be useful for other needs. Click Here to download excel sheet which will help you to make calculation that how much you can save by doing prepayment. So due to prepayment Mr.X could close home loan 9 year earlier. He could save significantly on interest part. Above table shows that by making prepayment Mr.X could reduce interest burden by 50 %. As per current Income tax law principal repayment of housing loan up to 1 lakh (Under 80 C) is exempted, not only that interest payment up to 1.5 lakh is also exempted. So by making prepayment you can avail dual benefit, tax saving and saving on net interest paid. If you are thinking of taking tax benefit also, do remember that value of prepayment and EMI put together do not exceed 1 lakh 80 C limit. Amount exceeding 1 lakh will not be beneficial to you in terms of tax saving. Caution: – Another important point on tax saving part is prepayment amount cause direct reduction in principal and hence reduction in interest component. If you are in higher tax bracket and want to take maximum advantage of exemption limit of interest payment (1.5 lakh) you can avoid this prepayment it is your decision. But we see that small prepayment of home loan at earlier stage is good decision to save money on net interest paid. 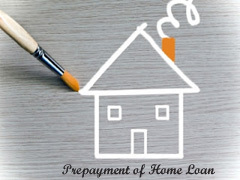 So finally if you can afford to make multiple prepayment towards your home loan, possibly due to salary hike, promotion, bonus or abrupt business profit then making prepayment of home loan is good proposal which can save you lot of money and term of loan. but the excel download is ordinary amorization table.